I trimmed Soft Finish/Spring Green card stock to a 6″ square card and used Els van de Burgt Studio “Through the Lens/Wood” card stock for the second layer. It reminded me of the time a Robin built her nest in a wreath I made on our door. I die cut my Round Grapevine Wreath 3x’s and 7 branches from CountryScapes Woods 1 to build the center of the nest. 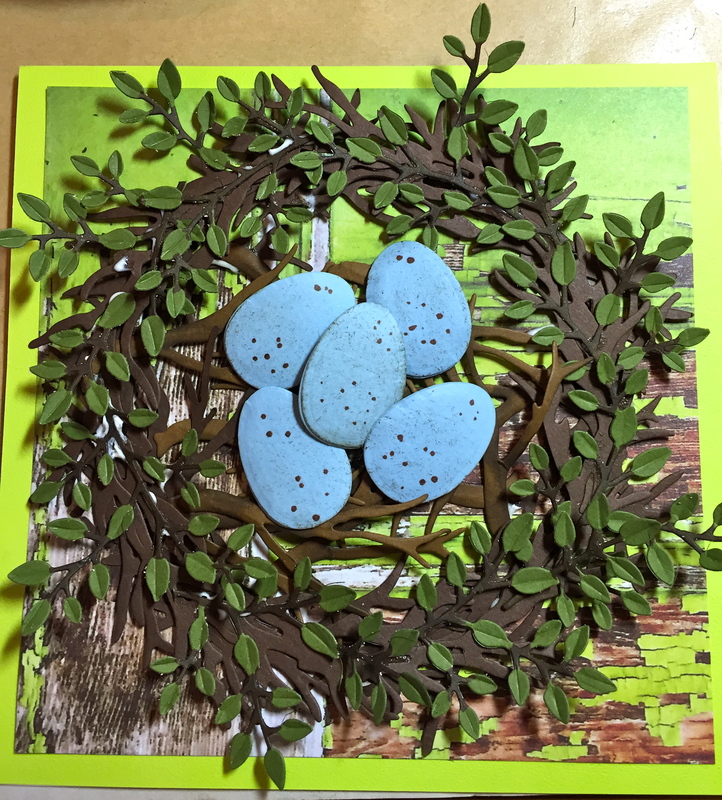 I die cut Joset’s Easter Egg in Premium Palette card stock in Pale Blue, five just card stock and 5 in card stock with Clear Double Sided Adhesive on the back. I put the two together for dimension and added some speckling with a Copic Marker. 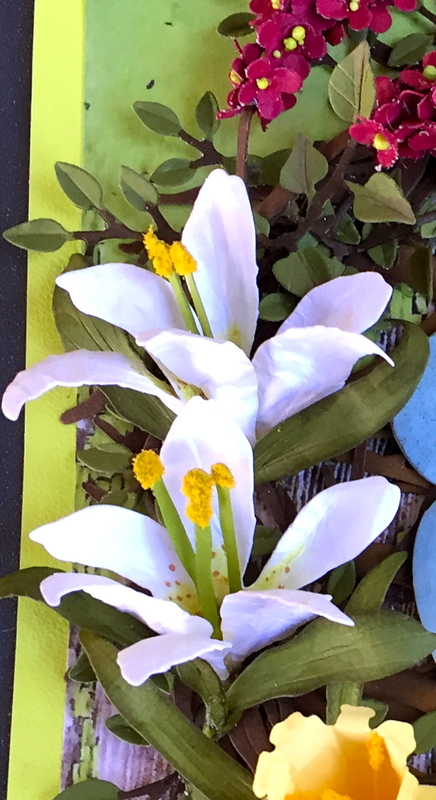 I also die cut my Garden Notes Daffodils in Yellow and Lilies in White (to resemble Easter Lilies.) Later, I die cut Pansies in Soft Finish White card stock and colored them with Copics and added a branch of Lilac in a deep shade of burgundy, but you can surround the nest with your favorites, or just leave it plain! 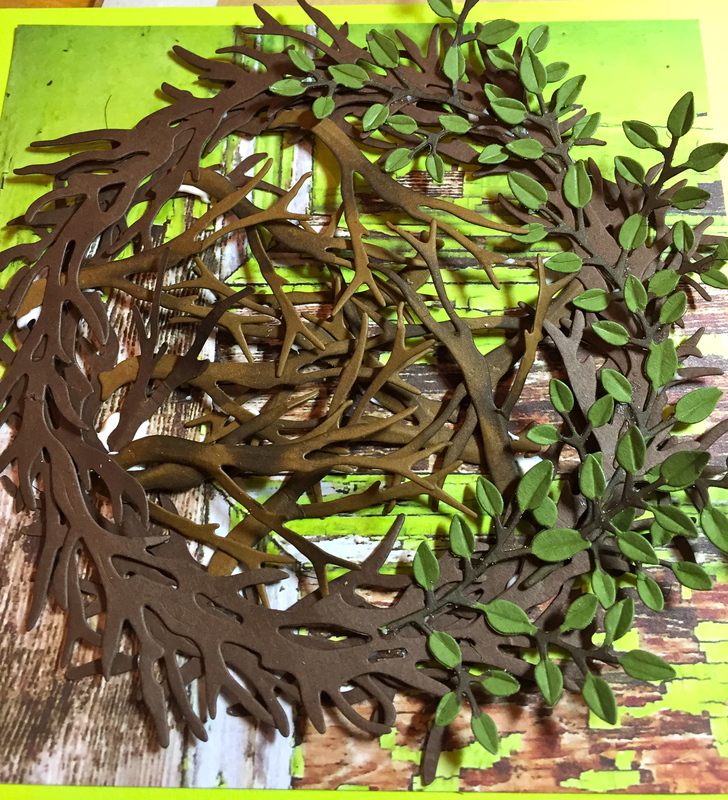 I also die cut Els’ Leafy Branch 4x’s in Premium Palette/Olive. 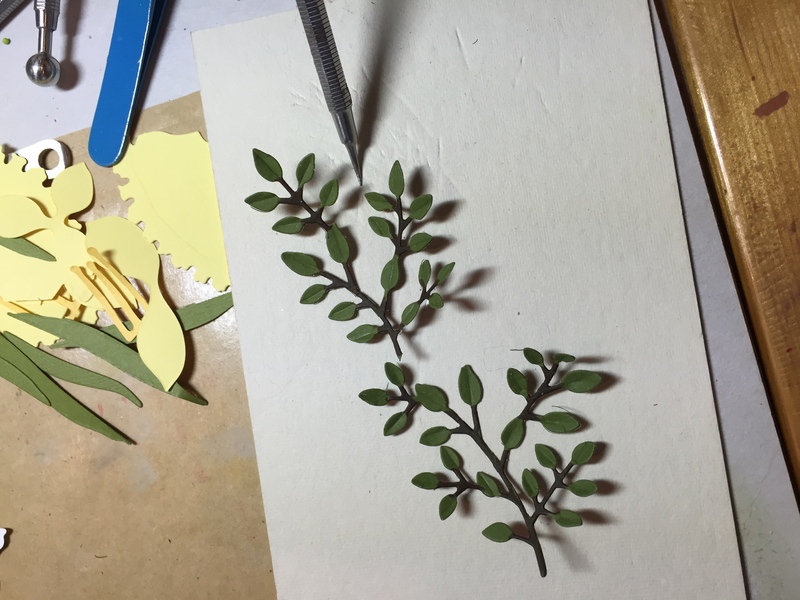 I colored the branches of the Leafy Branch with a Copic Marker E29. Assemble the card. Use a toothpick to apply a small amount of glue to the underside of the Round Grapevine Wreaths and glue on top of each other, offsetting the branches slightly. 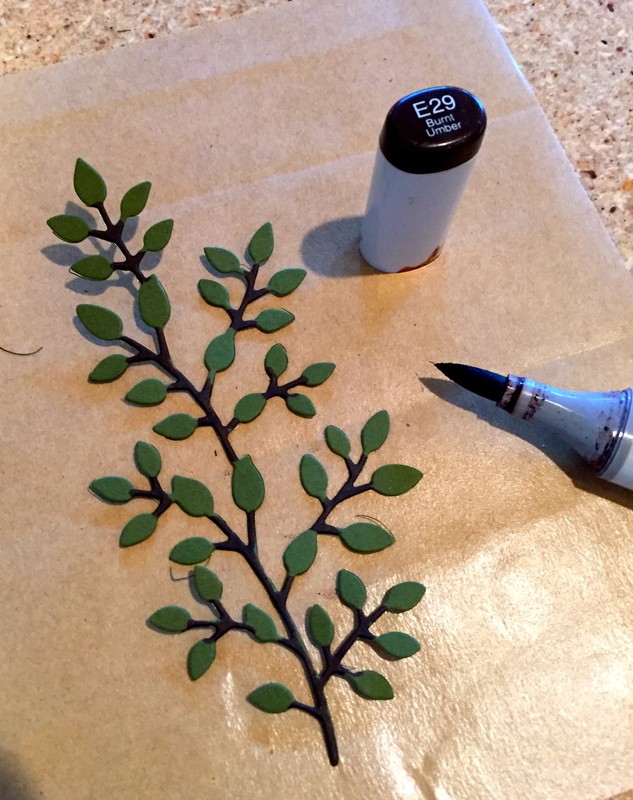 Shape the branches slightly on the Leaf Pad using the Leaf Tool and glue in the center. Cut the Leafy Branch in half and shape the leaves on the Leaf Pad with the Leaf Tool. Add around the nest. 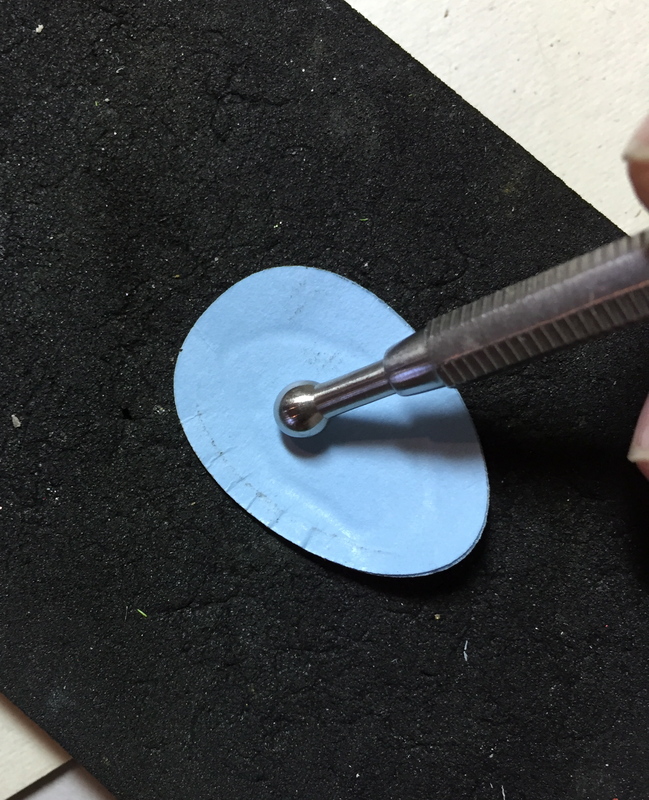 Shape the Robin’s eggs on the Molding Pad using the medium ball stylus. Place a foam square on the back and arrange eggs in the center. At this point, you could say this project is done! What a wonderful expression of renewal, but I had to add flowers, like the wreath on my door. There are YouTube videos for all my flowers and you can look back on my blog and see how I color Pansies, but I wanted to show you how to shade the Lily to resemble an Easter Lily, which are appearing in the nurseries now. I used PanPastels/Bright Yellow Green from Set 1 to shade the stem end, then Copic Marker #E15 to add the “freckles” for detail. Place the 3-petal piece on the Molding Pad and use the Loop Tool to shape. Use tweezers to pinch and bend. Dip the stem end into glue and adhere it to your project. Roll the stamen and dip the ends into Yellow Pollen or Prills. Set in place. 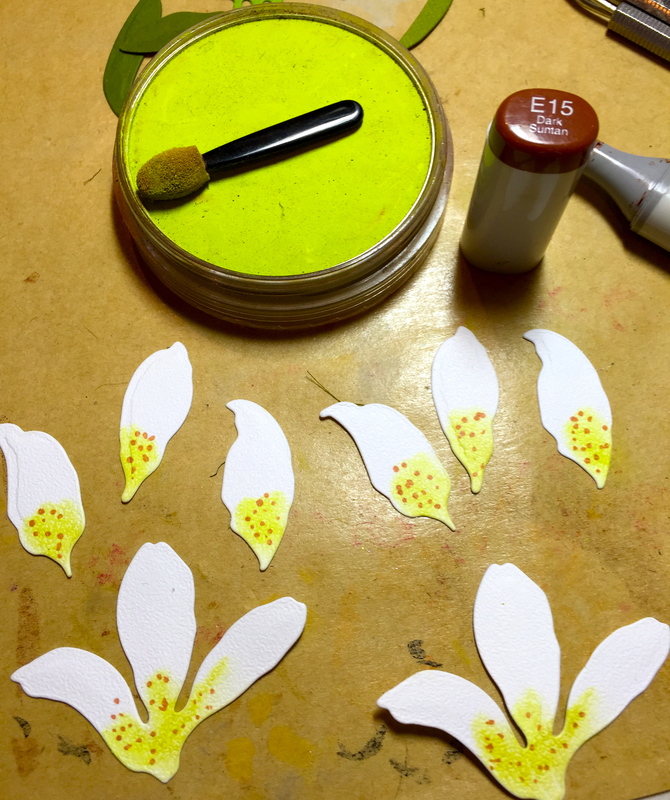 Shape the individual petals with the Loop Tool and place around the stamen. Stem the leaves and place around the flower. 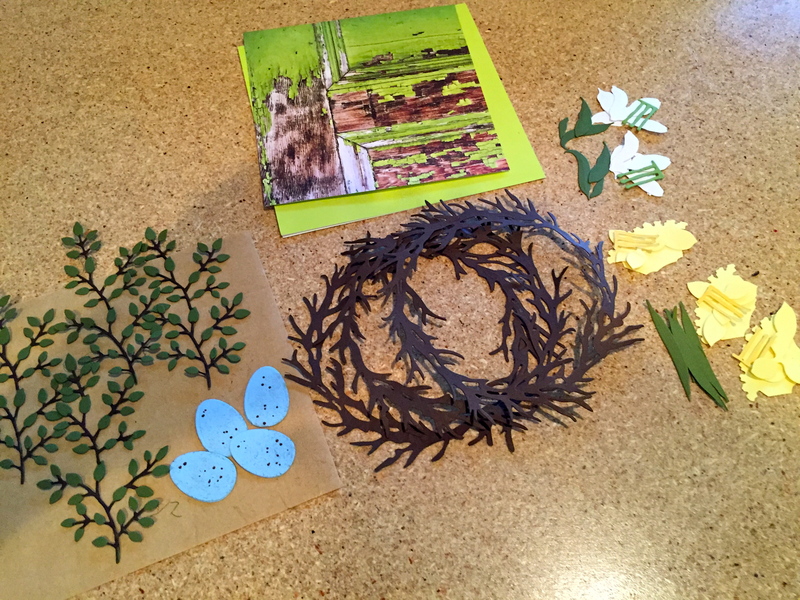 I added Daffodils, Pansies and a Lilac branch, but you can create your favorite flowers for this Spring Season. Let this project bring back a memory for you as it did for me. It’s All in the Technique! Oh wow that is just amazing and beautiful!! This is just beautiful! Thanks for the inspiration! I’m putting lilacs on my next order! Along with…….! OMG, this is so pretty! I hope that the recipients of your beautiful projects appreciate the time and work and I’m sure love, you put into these works of art! They’re beautiful with your calligraphy ! Love the dimension and details! Beautiful! This Is really gorgeous, Susan!! I love your flowers. Happy Easter to you and yours, Eva. This is an amazing card. I love it.